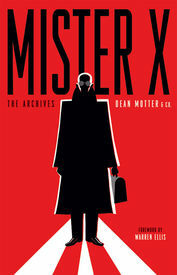 Yes, this 384 page softcover collecting the entire initial run of Mister X contains some excellent graphics by Paul Rivoche (who also contributed a nice short piece) and Dean Motter, two short pieces by Dave McKean and one by Bill Sienkiewicz, as well as the first notable body of work by Seth, but this archival collection will primarily be of interest to Copacetic customers for the simple reason that the first four issues of the series are by Gilbert, Jaime (and Mario) Hernandez! These four issues are absolute gems that were originally created in 1984, when the Hernandez brothers were in their first flush of fame and critical acclaim and still relatively new to the business side of comics. These comics gave them the chance to try their chops at a fresh, new, as yet undefined, conceptually interesting science fiction comic book concept – published in Canada, no less – and so they went for it! The 82 pages of comics they produced for the first four issues that are collected here (sadly excluding the also brilliant "Tales from Somnopolis" by Gilbert and Mario [which were, however, collected by Fantagraphics as Tales from Shock City in 2001]) were in the vanguard of the comics of that period, maintaining the unprecendented focus on character-driven narratives pioneered in the pages of Love and Rockets – but here focused on an enigmantic protagonist, and produced in full color. These comics were, to the best of our knowledge, knowingly crafted by Jaime and Beto for full color reproduction, with almost all the art chores handled by Jaime and the writing likely mostly by Gilbert with assists from Mario. Coloring and lettering duties were carried out by Paul Rivoche, Klaus Schoenfeld and Ty Templeton. These are truly great comics! (Just how great will be immediately apparent to anyone who attempts to keep reading beyond these first four issues [which we don't recommend]. Despite the susequent artists' (prinmarily Seth) working hard to maintain the look and feel of Jaime and Beto's comics, their comics seem hollow and lifeless by comparison.) We highly recommend this collection to any long time Love and Rockets readers, all of whom will – at the very least – get a kick out of the first four issues, and many – especially any who have a special fondness for Jaime & Beto's 1980s work – will be in for a real treat here. We initially held off on actively promoting this as it seemed unfair to Copacetic customers to burden them with a collection 2/3 of which we could not recommend (and also because the Hernandez brothers were never – to the best of our knowledge – properly compensated for their work here; but that's a whole 'nother story...). Now, however, we have gotten our hands on a nice stack that we can offer for a price that is appropriate to pay for just "the good stuff." And, really, comics don't get any better than this. Don't miss this chance! Supplies – at this price – are limited. We posted pics of a few spreads on Instagram, HERE.